Io is a particular type of low key science fiction film that puts the human element front and center. It’s not a movie for those seeking spectacle or profundity, but rather those who are drawn into its understated drama about what are perhaps the last two people on Earth. Since the movie has much to say about a very specific reaction to environmental catastrophe, as well as trying to function as a story about two lost souls, director Jonathan Halpert has the difficult job of making Io feel both expansive enough to sell its premise but intimate enough to make you care about its very few characters. There are really only two. 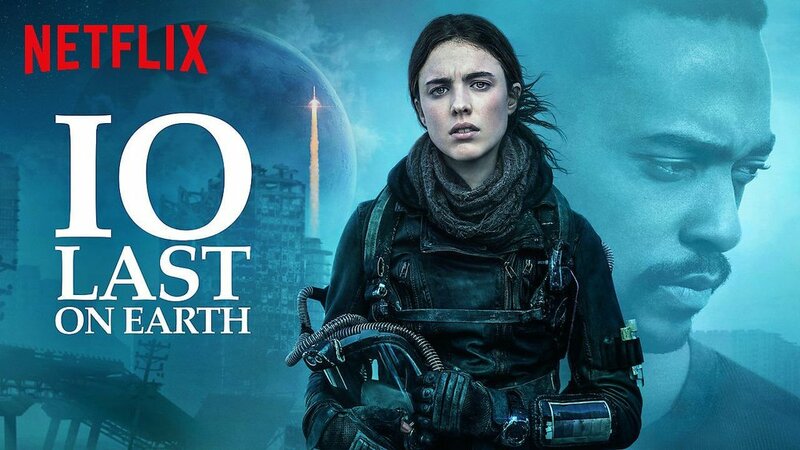 Sam (Margaret Qualley), a lone young woman who is trying to science her way to redeeming Earth as a habitable world, has the bulk of the screen time and heavy lifting. One day, Mica (Anthony Mackie) comes along in a balloon on a search for her father, a famous scientist (Danny Huston) who has argued for keeping the faith about Earth even as most of the population has abandoned it to live in the orbit of Io, one of Jupiter’s moons. There are a few different threads in the movie. The first is the problem of life on Earth for the actual humans, which Sam was raised to view as solvable. Mica, on the other hand, insists that they leave and the (mostly) quiet drama that erupts between them revolves around the impossible choice Sam has to make. It’s interesting that they are meant to be several years apart in age as this is reflected in their interactions and ideology throughout the film. Context defines their relationship, allowing the situation itself to take the lead even as the characters sometimes have little to say. Mackie handles the restrained anger of Mica adequately, but the real draw here is Qualley who has to carry the movie and provide enough intrigue to keep us on her side even as her reasoning seems increasingly strange and mystical. The second thread is the point of view the movie has about the possibility of a global climate catastrophe. Something so bad that it has popularized the notion of colonizing other worlds because we may be wrecking this one. Io takes that idea on directly, wrestling with whether it makes sense to leave our planet and what that can or should mean to us. A lot of the “fiction” part of science fiction enters into the movie here, where we consider a future time when we have some choices available to us and enough pressure to have to make them. Which brings us to the third thread, the movie’s reliance on Henry David Thoreau. Sam and her father’s last name is Walden, an obvious allusion to Thoreau’s famous work about living in nature. Sam, in many ways, parallels Thoreau’s relationship to nature and other people. She has her own struggle with her sense of the sublime in nature, whether to abandon hope in that, and what human connection means to her. It’s an interesting, if perhaps too understated, bit of character study. Sam is a scientist and we see her using science to deal with the questions and issues in the story. The questions science can’t answer keep intruding, culminating in that central choice to leave or not leave. Some viewers may reject the movie the second it strays from the empirical path. Because Io is largely about where that path ends. It might also move other viewers to see a character who can embrace both a naturalist’s faith and logic in her decision-making. It’s worth mentioning that understanding what Io is trying to say is not the same thing as concluding that it says it well. It may be too slow, dour, and quiet a movie to effectively keep the audience engaged. There are other films out there that probably handle some of the “rational vs. irrational” themes better, with stronger dramatization and dialogue. However, what makes Io unique is that it explores these matters within the confines of a premise that many consider prescient. Taken as an argument that we should look to our home first, rather than for new ones the moment ours seems inconvenient (after we’ve effectively destroyed it), is an essentially environmentalist one. To the extent that it provides an example of overtly environmentalist science fiction, Io is at least worthy of respect.